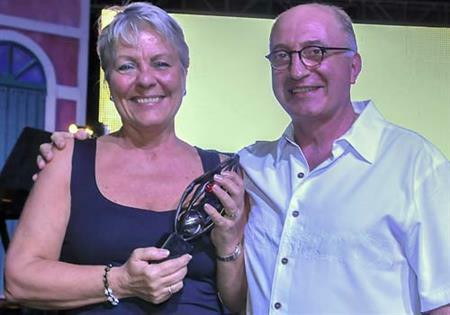 Anne Wallin Rødven, Convention Director at VisitOslo - Oslo's CVB, received the Moises Shuster Award at a gala dinner during the 51st ICCA Congress in San Juan, Puerto Rico. The Moises Shuster Award is the association's highest honour for outstanding service in the international meetings industry, named after one of ICCA's founding fathers and past Presidents. It recognises those individuals who have contributed towards ICCA's global success, and who have gone beyond the requirements of their professional role to advance our industry and inspire new generations. Anne Wallin Rødven served on the ICCA Board of Directors between 2002 and 2007, chairing the Destination Marketing Sector and championing the vital role of convention bureaux. Passionate about education, committed to raising standards, and a strong advocate on our industry's behalf, this award recognises Anne's enormous contribution since she first entered the international meetings industry in 1990. ICCA President Arnaldo Nardone, delivering the award at the gala dinner said: "Anne is recognised not only as a consummate professional, but is above all a warm and friendly colleague, always willing to share her experience and knowledge, and constantly acting as a mentor to young future leaders. "She has been a tremendous leader and role model in ICCA's Scandinavian Chapter, a source of creative and progressive thinking on the ICCA Board of Directors, and someone who I am honoured to count as my friend." With a warm, sunny climate, stunning backdrops, a rich history and culture, fine gastronomy and activities aplenty, Malta can cater to events of all types.